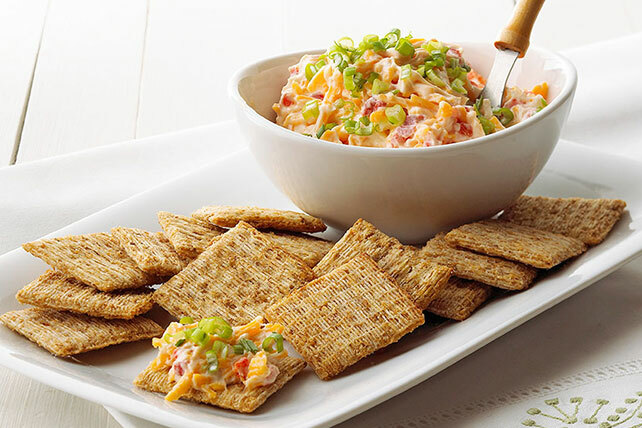 This easy-to-make cheese spread makes a great cracker topper or sandwich spread. Mix cream cheese and mayo in medium bowl until blended. Stir in cheddar and pimentos; top with onions. Prepare using PHILADELPHIA Neufchatel Cheese, KRAFT Light Mayo Reduced Fat Mayonnaise and KRAFT 2% Milk Shredded Cheddar Cheese. This delicious cheese spread can be prepared ahead of time. Refrigerate up to 2 days before serving. This easy-to-make cheese spread also makes a great sandwich spread. For each sandwich, spread 1 whole wheat bread slice with 2 Tbsp. prepared cheese spread; cover with second bread slice.